>> Are you a victim of the gender war? ​Are you tired of being treated as a victim? Are you tired of feeling like a victim​? I’m appalled about how many people have bought into the idea that women are victims. I’m tired of listening to the modern feminist telling us how bad it is for us women. We’re underrepresented as CEO’s. We’re raped and sexually assaulted. We’re the bullied at work. And the list goes on and on of the innumerable pains we suffer right now. Plus of course, men are bad, bad, bad. Look I’m not naïve about the perils of being a woman in the XXI century. I’ve got my share of s#*t: sexual abuse, building my career in a male dominated environment, bullied by other women and more. Still I refuse to see myself as a victim. I’m not. You are not. I totally and utterly disagree with the modern rhetoric of saving women from the wicked men. I have found a framework that describes what I seen in this gender war. Dr. Steven Karpman studied innumerable unhealthy relationships in families, business, bedroom, and classroom. He created a scheme that depicts the game behind dysfunctional relationships. 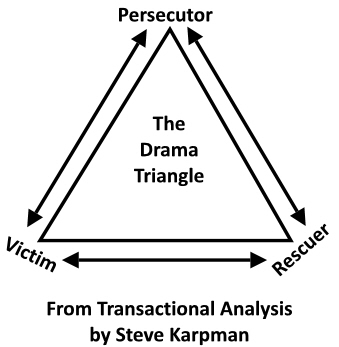 This is the Drama Triangle. This framework describes how we interact with each other, reinforcing conflict with our thoughts, assumptions and behavior. ​Women are the victims. We’re overwhelmed by our own vulnerability. We’re innocent victims of all what’s happen to poor little us. We have rights, many rights. The word responsibility is not mentioned anywhere. Men are the persecutors. They are the bad guys. They are unaware of their own power and therefore discounting it. Power is negative and often destructive. The 4th wave feminists are the rescuers. They save women, who are seen as vulnerable and even helpless. These rescuers offer unasked for help. They see injustice everywhere. What is this drama doing to men? You know what happens when you tell a boy repeatedly that he’s bad. He becomes so. He learns to embody “bad” and loath himself. The reactions of men to these continuous bombarding are distressing. Do you know that according to the OECD, in developed countries, boys under-perform girls at school. They are much worse at reading, less likely to go to university, and their lead in math is shrinking. And this doesn’t stop here. These under-performing boys in adulthood have bad health, low wages and little trust in others. ​The following video is the trailer of a brilliant documentary on this very subject. It's The Mask You Live In. It gets even worse. Do you know the suicide statistics per gender? According to the WHO in the western world, for every woman who commits suicide there are FOUR men who make the same choice. In the whole world is “just” double. What is this drama doing to women? The message that this drama has for women is that they weak and vulnerable. They are not good enough. They need to be empowered, fixed or healed. They have to work harder and harder. They must be tougher than men. They cannot trust neither men, nor women. So, they “just” have burnouts. They work themselves to exhaustion in the search for constant improvement. Many end up in high levels of organizations single, divorced and/or childless. I’m not suggesting to go back to the middle ages: put women in the kitchen and men in the center of life. NO! I totally appreciate the work of the early feminists. 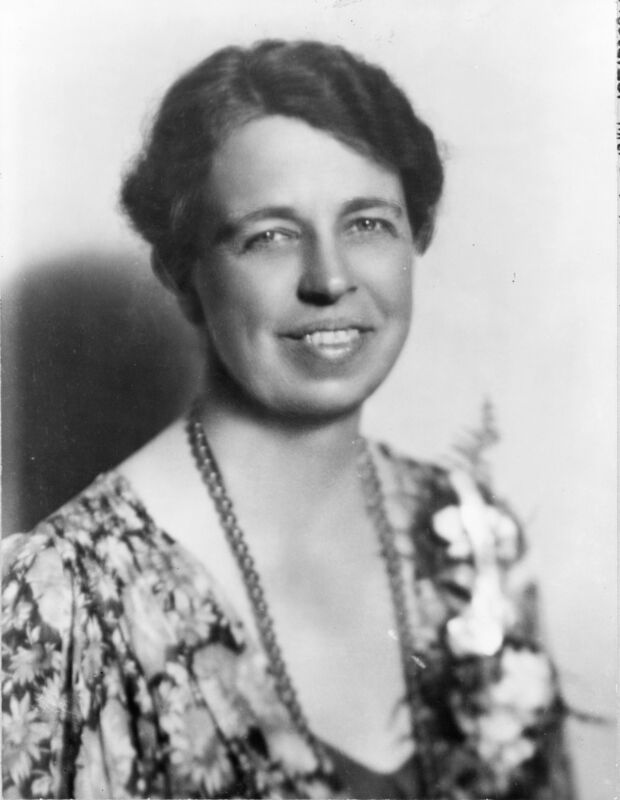 Women needed equality of rights. My opinion is that we have gone too far. We need to take a step back and ask different and better questions. We need to incorporate compassion in the equation. Can we stop this drama? The short answer is YES. There are several therapeutic models that have proven to be able to change this drama into a productive and nourishing relationship. But, do we want to stop this drama? The shocking thing is that we don’t want to stop this drama. We want to perpetuate it because it provides us with emotional rewards that keeps us hooked. Of course this is unconscious. Being a victim is very intoxicating, but dangerous. It’s not a weak role as manipulation is its powerful weapon. If the victim is not persecuted, she will seek out a Persecutor and also a Rescuer who will save the day, and so perpetuate her “Poor me!” stance. Rescuers keep this game going because they feel guilty if they don’t rescue the poor victim. Yet this rescuing has negative effects: it keeps the victim dependent and gives the victim permission not to take responsibility. The rescuer needs to be wanted, needed and valued. Should we stop this drama? Well if we care for the well-being of humans the answer is easy. We must stop the gender war as soon as possible. It’s not a luxury. It has become a matter of life and death. Yes, you can. You don’t need to convince the world to change. You can be the change. 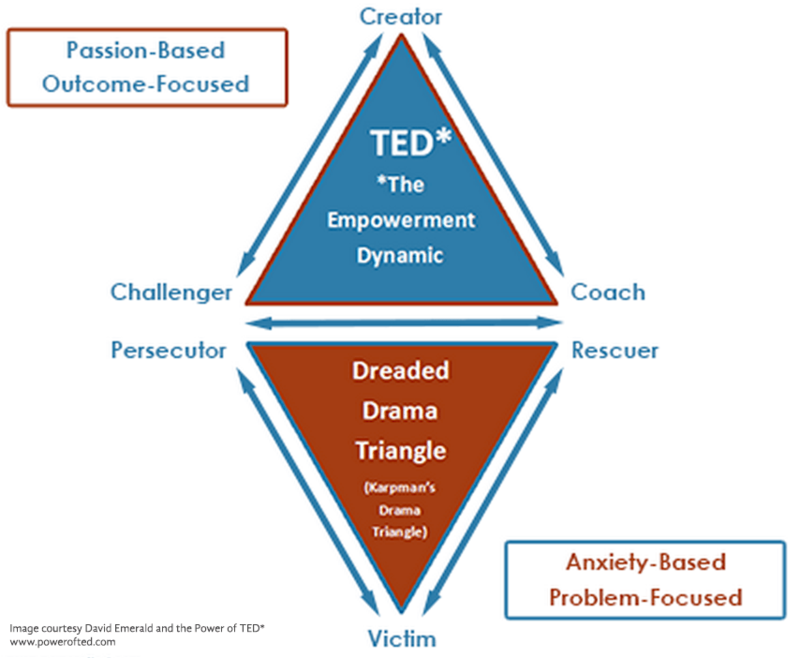 David Emerald created a very uplifting and exciting framework: The Empowered Dynamic (TED). TED Is a very slick solution taking us out of the drama into empowerment. He based his proposal on the idea that the victim can proactively take a different more compassionate and useful stance. In a nutshell, he recommends that the "victim" adopt the role of creator, perceive the persecutor as a challenger, and enlist a coach instead of a rescuer. ​The first step of change is in the mind of the “victim”. She must stop seeing herself as such. Instead see herself as a powerful creator, one who acknowledge her own power and can decide how to use it. This will automatically change her perception of the persecutor. 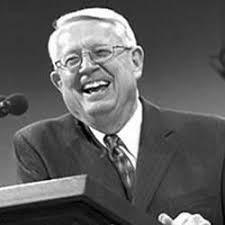 He becomes a blessed spiritual teacher, in the terms of TED, a challenger. Seeing the interaction with the persecutor/challenger as an opportunity to clarify your own needs will allow you to forgive, learn and grow. I actually used this re-framing method for stepping above my ​pain of sexual assault. I decided I refused to see myself as a victim. I decided to refuse to see him as a persecutor. He was just perpetuating what he suffered. I decided would transform that experience into gold for my future, for the future of my children and for others. I forgive him. I’m in control and even grateful. When I did this re-frame, it felt like taming a dragon. It was just like becoming a dragon rider. I so long to see all women taming their own dragons. This is so important! Remember: where attention goes, energy flows. Concentrating on our outcomes will allow us to see the solutions (the “how”). When you reach this level of perception/empowerment the rescuer is not truly needed, because the drama has disappeared. David Emerald proposed to transform the role of the rescuer into a coach. This is quite encouraging, because the open questions of the coach will allow the creator think more clearly. The key difference between a rescuer and a coach is that the coach sees the creator as capable of making choices and of solving his or her own problems. Did I convince you to be more compassionate with men? I hope so! Did I empower you to be a dragon tamer and rider? I hope so! If you made it all the way to read this, I'm extremely grateful and appreciative. I certainly hope that you found some hope and light in these words. If I managed to empower you to be more compassionate with others and with yourself, please do share in the comments what's the one action you'll take this week to make this real. Please remember that your words have power. By putting in black and white your intention, you are bringing reality to your intention AND they might be the inspirations that others need to their breakthrough. AND please do share the love. Share this with those who need a more appreciative and compassionate perspective in this painful gender war. Are you sure you do not have a midlife crisis?